Herbert Edward Cox, was born in Coventry in 1870, the fifth of seven children born to James and Sarah Cox of Stoney Stanton Road. He attended the Grammar School, and after the death of his father in 1887, still living in the family home, he trained to paint at the Municipal School of Art in Coventry, becoming a designer and draughtsman. When the family moved to Eastbourne, where Sarah kept a lodging house in 1901, Herbert took up textile design. Some of his design patterns for textiles and wallpaper survive in the Herbert Art Gallery collection in Coventry. Herbert returned to the Midlands after marrying fellow Coventrian, Margaret Shilton, a secondary school teacher, in Yorkshire. They moved to Manor Road, Lillington where a first floor extension was built to house an artist’s studio. 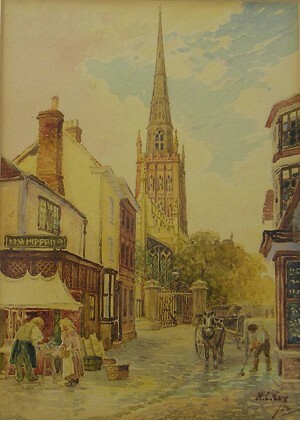 Herbert taught painting at the Coventry Technical Institute, (now the City College), and was soon recognised locally as an accomplished artist, recording street scenes of pre-war Coventry and many surrounding villages and towns. In June 1922, an exhibition of fifty of his works was held in Leamington Public Library. Seventy Cox paintings were purchased In 1930 by a Coventry benefactor to be presented to the Lord Mayor of Coventry for ‘outstanding achievements’ during his year in office. These works are now on display in the Camera Principis (Council House), Broadgate, Coventry, and can be viewed at any reasonable time on request. 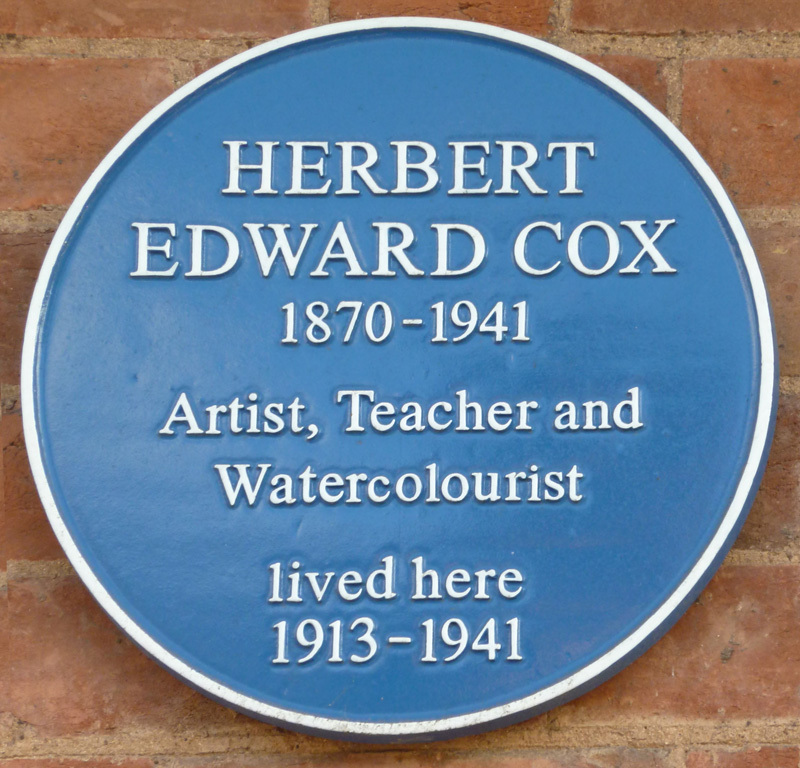 In addition to painting and designing textiles, Herbert Cox undertook other commissions. 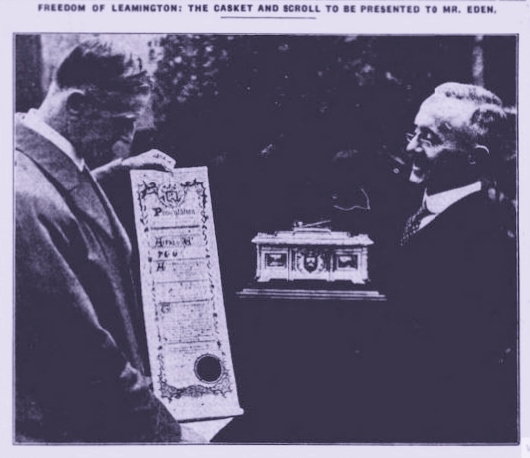 In 1933, he produced the illuminated scroll awarding the freedom of the City of Coventry to Sir Alfred Herbert, machine tool manufacturer and benefactor of the city museum which now bears his name. In 1936 Cox undertook the same task when the freedom of the Borough of Royal Leamington Spa was accorded to Mr. Anthony Eden. 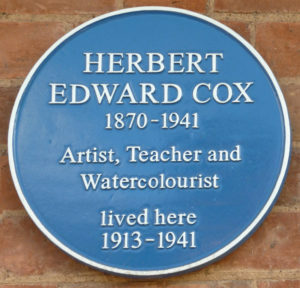 Cox left the Coventry Technical Institute two years before his death in 1941. He and his wife Margaret, who died in 1953, are buried together in the churchyard of St. Mary Magdalene, Lillington. In September 2011 his considerable talent and contribution to art was recognized when a blue plaque was unveiled at the house where he lived for over a quarter of a century, 7 Manor Road, Lillington. It was a fitting tribute to a prolific local artist.